(Sept. 15, 2017) Southwest Main Street, a key entrance into downtown Portland for people biking, walking and driving, will get a much-needed face-lift, with construction starting Monday Sept. 18 for a complete rebuild of the pavement and realignment of the bike lane, thanks to the voter-approved Fixing Our Streets Program. First Ave and SW Second Ave. Nighttime closures begin on Monday night, Sept. 18. Daytime lane closures begin Thursday, Sept. 21. Two travel lanes will remain open during daytime hours from 9 a.m. to 3 p.m. on weekdays, but with intermittent closures that only allow one lane open from time to time. This section of SW Main Street normally has two travel lanes, a right-turn lane and a bike lane. The project will greatly improve a section of failing roadway that serves as a main entrance to downtown Portland from the Hawthorne Bridge. The pavement is cracked, buckling and sagging. People riding bicycles westbound on the bridge, one of the busiest bike routes in North America, find it difficult to navigate the road surface. The road striping has bus and bicycle traffic weaving in the middle of the intersection. The project will replace the base underneath the road surface and provide new asphalt that will extend the life of the pavement by 15 to 20 years. A concrete bus pad at the transit stop will further ensure the resiliency of the street improvements. 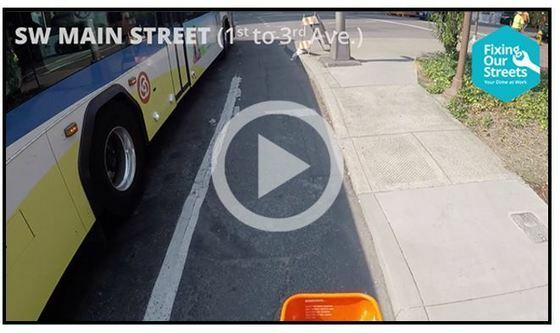 A new bikeway design will provide a bike box to increase visibility of people on bicycles at SW Main and First Ave. It will provide new green striping to highlight areas that are bike only, as well as areas where bike traffic and vehicle traffic intersect. Green boxes will also mark places at intersections where people riding bikes are recommended to change direction. 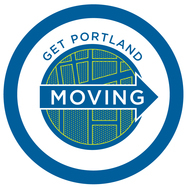 The Multnomah County Courthouse, Multnomah County Morrison Bridge Closure, and PBOT’s Fixing Our Streets Program have been coordinating through the Get Portland Moving effort to limit the effects of construction projects in the right-of-way on the general public. 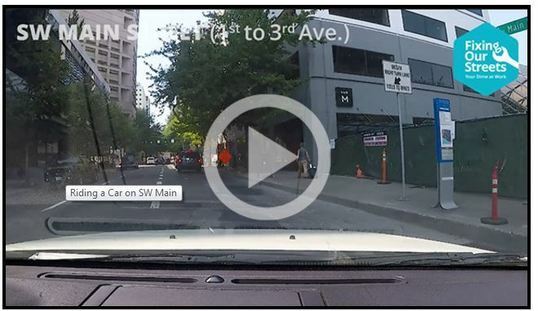 The pedestrian island at SW First Ave and SW Main St has to be reconstructed to repave SW Main St. A Morrison Bridge full bridge closure has been rescheduled until the Main Street project has completed the majority of its work in the right-of-way. Weekday nighttime full closures start Monday, Sept 18: All travel lanes and the bike lane will be closed. The work hours will vary, generally between 7 p.m. and 6 a.m. Sidewalks will remain open. Weekend full closures, Sept. 30-Oct. 1, and Oct. 14-15: All travel lanes on SW Main St will be closed from 7 p.m. on Fridays to 6 a.m. on Mondays. Sidewalks will remain open. Weekday daytime lane closures start Thursday, Sept 21: Two travel lanes will remain open during morning and evening rush hour. Intermittent closures that only allow one lane open from time to time will occur between 9 a.m. and 3 p.m. on weekdays. Bike detour information: People riding bikes westbound on SW Main St may ride in the travel lane. They may also be more comfortable using signed detour routes that direct people riding bicycles to exit the Hawthorne Bridge ramp into Gov. Tom McCall Waterfront Park. From the park, people on bicycles may cross SW Naito Parkway at the marked crosswalk to go southbound on Naito Parkway, then westbound on SW Jefferson St. View a map of the bike detour route. Bus detour information: The bus stop at SW Main between First and Second avenues has been relocated temporarily to SW First Ave, between SW Madison St and SW Jefferson St. Routes affected include 4, 10, 14, 15 and 30. For updates on TriMet service, check for service Alerts at trimet.org or call 503-238-RIDE (7433). View a map of the temporary bus stop location. The Fixing Our Streets program is the result of the passage of Measure 26-173, a 10-cent tax on motor vehicle fuels and Portland’s first local funding source dedicated to street repair and traffic safety projects. Passed on May 17, 2016, Measure 26-173 will raise an estimated $64 million over four years. PBOT will invest this money in a wide variety of street improvement and safety projects across the entire city. Fixing Our Streets will help PBOT expand preventive street maintenance that saves money and prevents potholes. It will support our work to make it safer for children to walk to school. It will allow us to build more sidewalks, traffic signals, street lights and bike lanes. 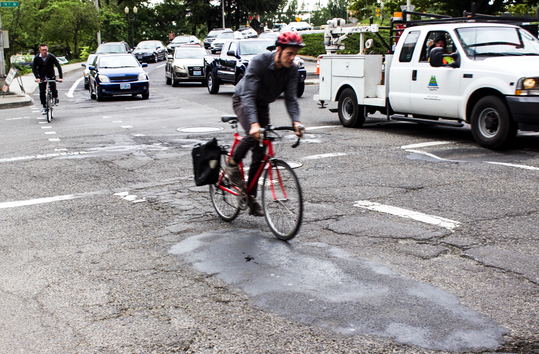 The Portland City Council also unanimously passed a Heavy Vehicle Use Tax, for vehicles weighing more than 26,000 pounds, which will also fund the Fixing Our Streets program.